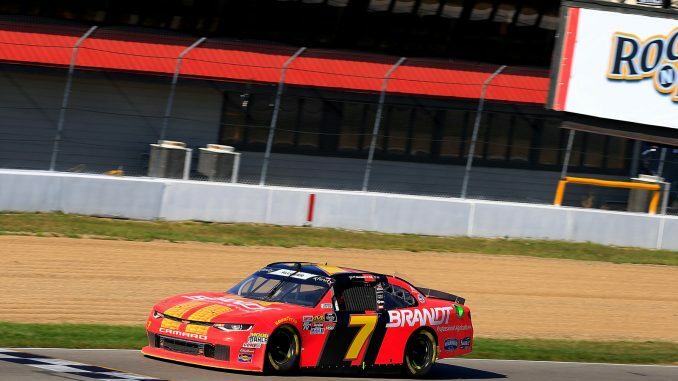 Justin Allgaier pulled off the NASCAR version of a “spin and win” to take the Xfinity Series victory in Saturday’s Rock N Roll Tequila 170 at the Mid-Ohio Sports Car Course. The JR Motorsports driver of the No. 7 Brandt Chevrolet rallied from late-race contact and a spin to pass Austin Cindric with eight laps remaining, claiming his third win of the season and first at the famed 2.4-mile road course. Cindric’s No. 22 Penske Racing Ford won the pole position and led a dominant 59 of the race’s 75 laps but his track position gamble out front on old tires couldn’t hold off a hard-charging Allgaier, who pitted for new rubber in the race’s final caution period with nine laps remaining. Cindric held on for second place. Richard Childress Racing driver Daniel Hemric finished third, followed by teammate and Ohio native Matt Tifft. Ryan Truex rounded out the top-five. Allgaier beomes the sixth different winner in as many Xfinity races at Mid-Ohio. The race was typically “road course aggressive” with lots of bumping and banging throughout the field, particularly in the waning laps. And the final pass for the lead was the result of dramatic back-and-forth, give-and-take between Cindric and Allgaier, who exchanged the front position three times on a single lap before Allgaier pulled away for the checkered flag by 2.095-seconds. For his part, Cindric was understandably disappointed to come home runner-up because he had clearly been the class of the field all weekend. The 19-year old Indiana-native came just two-seconds away from claiming his first Xfinity Series win, but did lead the most laps and earned a stage win as well. “It was a big points day for me… but too bad we couldn’t capitalize with a dominant car,’’ Cindric said. Four-time race winner and series points leader Christopher Bell ran as high as second place at one point, but heavy contact between him and veteran Elliott Sadler in the closing laps spun Bell’s No. 20 Toyota around and caused a final lap catch-up session. He ended up 11th and still holds a 17-point advantage over Hemric and Elliott in the standings with four races left to set the Playoff field. Former Monster Energy NASCAR Cup Series Rookie of the Year, Andy Lally led seven laps and finished 15th – leading the road racing contingent to a good showing on the afternoon. IMSA standout and former IndyCar driver Katherine Legge finished 30th, having to retire her car 10 laps from the end with engine problems. She is scheduled to compete with the Xfinity Series again at Road America in two weeks – as is NASCAR Hall of Famer Bill Elliott, who is coming out of retirement for that race. The Xfinity Series races the Food City 300 at Bristol Motor Speedway next Friday at 7:30 p.m.
1. (7) Justin Allgaier, Chevrolet, 75. 2. (1) Austin Cindric #, Ford, 75. 3. (9) Daniel Hemric, Chevrolet, 75. 4. (5) Matt Tifft, Chevrolet, 75. 5. (6) Ryan Truex, Chevrolet, 75. 6. (2) Elliott Sadler, Chevrolet, 75. 7. (4) Cole Custer, Ford, 75. 8. (20) Spencer Gallagher, Chevrolet, 75. 9. (13) Alex Labbe #, Chevrolet, 75. 10. (11) Ryan Reed, Ford, 75. 11. (10) Christopher Bell #, Toyota, 75. 12. (16) Brendan Gaughan(i), Chevrolet, 75. 13. (12) Kyle Benjamin, Toyota, 75. 14. (18) Chase Briscoe, Ford, 75. 15. (8) Andy Lally, Chevrolet, 75. 16. (14) Ross Chastain, Chevrolet, 75. 17. (17) Jeremy Clements, Chevrolet, 75. 18. (24) Michael Annett, Chevrolet, 75. 19. (30) Tommy Joe Martins, Chevrolet, 75. 20. (28) Josh Bilicki #, Toyota, 75. 21. (32) David Starr, Chevrolet, 75. 22. (23) Justin Marks, Chevrolet, 75. 23. (3) Brandon Jones, Toyota, 75. 24. (27) Joey Gase, Chevrolet, 75. 25. (35) Spencer Boyd #, Chevrolet, 75. 26. (33) Tim Cowen, Ford, 75. 27. (19) Kaz Grala #, Ford, 75. 28. (31) Garrett Smithley, Chevrolet, 75. 29. (36) Chad Finchum #, Toyota, 75. 30. (22) Katherine Legge, Chevrolet, Engine, 65. 31. (15) Tyler Reddick #, Chevrolet, Accident, 60. 32. (25) JJ Yeley, Chevrolet, Rear Gear, 48. 33. (26) Cody Ware(i), Chevrolet, Accident, 37. 34. (21) Ryan Sieg, Chevrolet, Transmission, 29. 35. (39) John Jackson, Dodge, Transmission, 23. 36. (38) Vinnie Miller #, Chevrolet, Brakes, 14. 37. (37) Stephen Leicht, Dodge, Clutch, 11. 38. (40) Morgan Shepherd, Chevrolet, Overheating, 9. 39. (29) Jeff Green, Chevrolet, Brakes, 6. 40. (34) Dylan Murcott, Toyota, Accident, 0. Average Speed of Race Winner: 73.312 mph. Time of Race: 02 Hrs, 18 Mins, 36 Secs. Margin of Victory: 2.095 Seconds. Caution Flags: 6 for 18 laps. Lead Changes: 7 among 4 drivers. 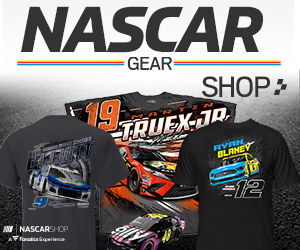 Lap Leaders: A. Cindric # 1-17; J. Allgaier 18-21; A. Cindric # 22-42; A. Lally 43-49; A. Cindric # 50-63; C. Bell # 64; A. Cindric # 65-71; J. Allgaier 72-75. Leaders Summary (Driver, Times Lead, Laps Led): A. Cindric # 4 times for 59 laps; J. Allgaier 2 times for 8 laps; A. Lally 1 time for 7 laps; C. Bell # 1 time for 1 lap.